Normally, it's about this time of year when we start talking about raising squillions for our shelter. If you're new to the blog, let me tell you, it's a very exciting event. If you care to see what it's all about, click on the label for any of the "Dog-A-Thons" of previous years. Things will be kicking off a little later this year. We'll still set a lofty fundraising goal, but we're just going to have to make it happen in a little less time. You see, my dear dad is having hip replacement surgery next week, so I'll be heading back to Iowa for 2.5 weeks to help my folks as he recovers. I need to give them my full attention, so I can't be worried about the squillions during this period. I'll still blog while I'm away - I've got more Clover stories to tell and will share plenty of Nigel and Mimsey updates too - I just need to wait until I return to focus on FUNdraising. I'm scheduled to return late on July 8th, and bright and early on Thursday, July 9th, I'll begin pestering you for money. I've already talked with the gals in the Foster Room and they promise to have a kitten dream team waiting for me to pick on the 9th, so we can start training them for the phone bank ASAP! The telethon set has been completed, so we can drop them right in and GO! We'll be auctioning off the naming rights for this batch, so if you want to get involved with that fun, start thinking of some good names now, please! Because things are going to be a little more condensed this year, it's going to require a little more planning on my part. I would love to get all of our matching donation challenges on the schedule soon, so if you're interested in offering up a challenge, could you please send me an email and let me know? We do challenges at any dollar amount, starting at $500. If you have a particular day you would like to see your challenge happen, or if it's in honor of someone, or for a particular cause (Senior Cats, TNR, Foster Program, etc ) please let me know. The fundraiser runs July 9th - July 25th. 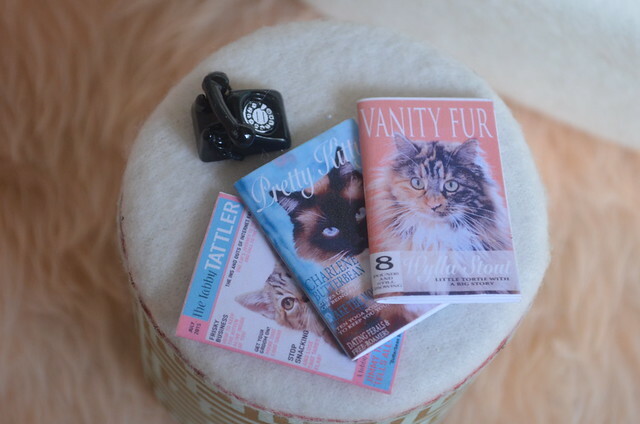 Though the telethon set is complete, I want to wait to share it all with you, so it will be a surprise when we kick off the FUNdraiser I'll give you a teeny tiny glimpse at it though - here are a few of the kitten-sized magazines that sit on one of the end tables on the set. Every year when I build a new set, I always have to turn it up a notch. This year, I went up at least two. Maybe six. It's pretty ridiculous. For those of you who are new, please click HERE to see what we did in previous years. Well, I better wrap this up and get back to prepping for my trip. I've got to get the cat food pantry stocked up, and pick up a couple of boxes of kitty litter. Craig will be solo-parenting while I'm gone, and I'll want to make it as easy for him as possible! Have a great weekend, everyone! I'll be back Monday with our first adoption tale! Best of luck to the Kitten Whisperer for his surgery and recovery! Safe travels to you, and healing thoughts to your dad! The squillions will happen when you return. We all will see to that. Give all our best to the Kitten Whisperer! Hopefully you'll get a few of those perfect Iowa evenings to enjoy. We'll all be ready when you get back! Hope your dad's surgery goes well. Best wishes to your dad, Laurie! Looking forward to the fundraising kickoff in July! Speedy recovery to the Kitten Whisperer! Good health and rapid recovery to the Kitten Whisperer! Prayers and good wishes to your dad! Lots of healthy, healing thoughts for the Kitten Whisperer!!! Can't wait for Dog-a-thon --- will definitely contribute on behalf of our four cats and the one over the rainbow bridge! Safe travels & speedy recovery to Mr Kitten Whisperer Sr! Love and best wishes to your dad, the Kitten Whisperer! We'll all be here ready to plunge into full fundraising mode when you return, Laurie. Happy trails! My comment posted too soon... Best wishes to the Kitten Whisperer on a full and speedy recovery! I bet Nigel and Mimsey will be happy to keep him company. And given those itty bitty magazine covers, I can hardly wait to see the rest of the set! Best wishes for a quick recovery to the Kitten Whisperer - he'll be in our prayers. LOVE the mini magazine covers!!! Can't wait to see the rest! Lots of get well and safe travel wishes from all of us. Best wished to your dad, the kitten whisperer, and safe travels! We wish your dad a fuss-free surgery and speedy recovery. Nigel and Mimsey will be of great help, I'm sure. My best to your dad! I hope the surgery is easy and the recovery quick! Love the set teaser! Best to you all! All the best to your dad! As someone who is close to her parents, I can understand how you want to be there to help. Be sure to give us some Nigel and Mimsey updates! My best wishes to your family and a speedy recovery to your father. I recently adopted a new kitten. Sylvie is now going on 12 weeks. I have told her tales of the Kitten Whisperer and am giving her a thorough IBKC indoctrination. We are strict with our kitty history education around here. She is saying her prayers for your dad and looking forward to seeing her 1st telethon set. Lots of healing thoughts and purrs will be going out to the Kitten Whisperer for a quick recovery! I know having you home to help out and just be there will give great comfort to your mom and dad. Safe travels! Tell the Kitten Whisperer he'll be fine - I had the same thing two years ago and it was actually pretty easy (incision in the front, which he can probably also have, makes for swift recovery). I just needed help hauling things around because I had to keep a hand on the railing going up and down stairs and for a few days also use a cane. Safe travels and best wishes to your parents and your fur-sibs, Laurie! Safe travels and speedy healing to the Kitten Whisperer! The best of luck to the Kitten Whisperer for his surgery and recovery! My prayers will be with your family. We never like to see our parents in these situations, no matter how simple people say they are. Prayers for the Kitten Whisperer to have a successful surgery and a quick recovery! You are a good daughter Laurie, look forward to whatever posts you have time for! Happy Father's Day to all the dads out there and those who love them! Good luck to your Dad! All that kitten whispering should give him the best karma. May you have safe travels to Iowa and back. I also send good wishes to your father for his upcoming surgery. Yukon, Sparta and Josie also send their regards. Sending positive thoughts and prayers for your safe travels and a very speedy recovery for the IBKC's very own Kitten Whisperer. Hugs to your Mom and Nigel and Mimsey, too. I read this with some amusement. We're cosmically trading places. While you are traveling to IA from WA, I'll be traveling to WA from IA. Keeping you in prayer for safe travels and all to go well with your Dad's surgery. Good luck to The Kitten Whisperer with his surgery. Waiting for Nigel & Mimsey updates. Suggestion - last day of Dog-A-Thon - auction off those wonderfully redunkolous magazines!!!!! Best wishes for a speedy recovery for your Dad!